La Quadrature has a revolutionary tool for maintaining its press review. http://www.laquadrature.net/fr/revue-de-presse (RSS) For articles in French. http://www.laquadrature.net/en/press-review (RSS) For articles in English. Note : Articles in other languages are listed on both pages. Sign up to the mailing list Press to participate in the task of grouping related links related to causes focused on by La Quadrature. It must address issues in which La Quadrature is committed, for example:Telecom Package, Hadopi, "Three strikes", Graduated Response, Project Olivennes, Internet Filtering, etc.. It must come from a major news organization, regional news organization (Ouest-France), national news organization (Le Monde, 20 minutes, tf1) or international news organization (International Herald Tribune, New York Times, Times of London). are not related to topics that La Quadrature is committed to. link to the main website's landing page. Links should be a permalink directly to an article, not an entire website. are link aggregators or blogspam sites. (such as Netvibes or urlfan). Find the original source of the article and link to that site instead. are from sites no one has heard of. Use good judgement here and link to sites that are established as credible sources for news. The integration of an article in the Press review is done in three steps. Google Alerts are automatically added to the queue that match our keywords. In the IRC channel, users can add a link to the press review queue by typing !rp followed by the URL you wish to be added. Note : Don't forget to add only URLs that haven't already been added so that the same link isn't in the press review twice. You can also use "!rpp"
A combination of both: "!rpcp"
It is also possible to add an "a" at the end of the command to archive an article, in the case where we want to keep the article, but not publish it. usage: !rpa, !rppa, !rpca and !rpcpa. Les URL sont alors prises en charge par Wantzel ( c'est un bot, si vous ne le voyez pas vous répondre c'est qu'il y a un soucis quelque part ) qui les stocke dans l'outil RP. URL commands are processed by Wantzel (it's a bot, if you do not see a response by the bot, there might be a problem with the command or an issue with the bot. ), and the bot adds the links to the press review system. The submission of articles in the press review is open to everyone, but it is necessary to be careful when proposing articles to be added. Any url submitted wrongly wastes time for people who work on the system. If you are in doubt ask in the channel before submitting an URL. View the original article. A link under will take you to the original site. The URL of the article. If you click it, you'll see the text version of the article + an automatic screen capture of the site. All of this is automatic and keeps a historical copy and a copy of the index. The Published flag when at zero points will have no thumb. The flag will be green when it has 3 or more points, and will be red when it is flagged as "not to publish"
If i thas the "cite us" flag and no thumb, it will either be turned into a green thumb if the article cites La Quadrature, or a red thumb if it does not. Edit this article in drupal (edit icon) see below how it can be accessed. See tthis article in drupal (blue engine icon). finally, where the article came from. If IRC you'll see IRC and the nickname. If from Google, you'll see which alert phrase triggered the link to be added. The purpose of the Press review is to first mark items as "to publish" or "do not publish" as well as "we are quoted" or "we are not quoted". Note : You will notice that the items which are scored "2" are not interesting enough to publish. who speak intelligently on the subjects of La Quadrature and is original content. Are a link to a main website, instead of a permalink to a specific article. When in doubt, don't mark an article at all. Just let someone else handle it. We mark "nous cite" (we're quoted) in any articles that quote La Quadrature. These articles are given priority because they are press *about us*. The choice of the publication of an article is based on its notes. Any score greater than or equal to 3 activates the "send the item in drupal" button. In principle, try to put some tags to ensure that an item is attached to a single file (eg ACTA, Net filtering, Net Neutrality, IPRED Directive for tags that match a file ). Avoid, for example, putting articles in more than one file, such as in both the "ACTA" folder and "Net Neutrality" folder. CETA CETA The Canada-EU trade agreement and content dossier related to it (content relating to copyright law, patent and trademark rights internationally) fall into this category. (For example, the commercial trade negotiations of d'ACTA/CETA/**TA. IPRED IPRED European Directive on the content of the application of intellectual property or of related documents. The content related to the SOPA Act ​​(which has its own tag) or other non-European initiatives to increase repression of sharing culture on the Internet can fall into this category: Filtering streaming sites or bitorrent trackers, measures imposed on payment services, etc.. These subjects are similar to those tagged "CETA" but they fit either in a national or at the European level. 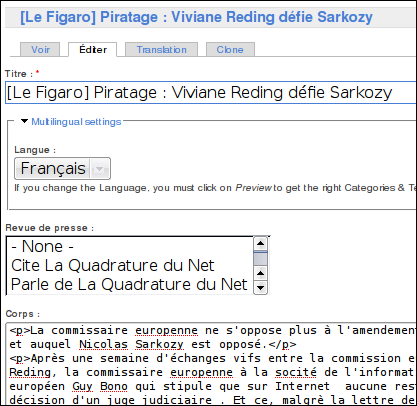 Neutralité du Net Net Neutrality Content related to the debate over net neutrality and of related documents. Here we must focus on the practices in use by telecom operators, the political debates to protect net neutrality neutrality (and thus exclude, for example, filtering measures against websites imposed by the government). Filtrage du Net Net filtering Content related to blocking measures of internet sites and other censorship measures. (as well as DNS) et other related documents. Generally speaking, when these measures relate to copyright, we prefer these go to the "IPRED" folder. liberté d'expression free speech Directly involves the law relating to freedom of expression, freedom of the press, etc..(ex : WikiLeaks, Copwatch, etc). Propositions Proposals Content on proposals human freedoms on the Internet and other propositions brought by La Quadrature. The news for this category should include propositional elements indicating what should be done at the policy and legislative level to protect online freedoms. Contribution créative Creative contribution On the proposals by Philippe Aigrain to create a shared funding for the creative works in the digital era (also add the "Proposals" tag) content. Financement mutualisé crowd-funding Other propositions of crowd funding such as "global license" (also add the tag "Proposals"). Once we have a list of articles to be published (the advantage of the system is that it can be done by another person ...) you can then publish on Drupal. For this, we must first be 'CONNECTED (this is important, 'MUST be connected) on the drupal account and the account of the quadrature drupal should have the right to create / edit the articles in the press review. You can use the filtering engine ('Show by published status and Show by citing status) to display only items to publish even for those that start with 'quote us (where we are quoted). Then take one of the articles to be published, which has nothing in its "node" column (which means that it has not already been published) and click on the disk. After confirmation, we are presented with the form (usually) published in Drupal. 2 - Choose the language : Put "Français" for articles in French, or "Anglais" for articles in English and the default option for other languages. The language should be set regardless of language. 4 - Check Quotes La Quadrature and/or Talks about La Quadrature if it applies. 5 - URL Path parameters , check automatic alias. A short extract relevant to the article. Usually 1 or two paragraphs, or 3 if it is really important. If necessary put [...] to make an ellipse, and put the citations in italics (<i>"citation"</i>), quotes by or about La Quadrature in italics and in bold (<i><b>"Quoted passage by La Quadrature here"</b></i>), and put the name La Quadrature in italics (<i>passage qui parle de la Quadrature</i>) and the name of the person who spoke should be in italics. Link to the original url. It is set automatically by RP on the last line / do not forget to leave it there, it is honest and it is still the source of the RP! 9 - finally, click on aperçu to verify your draft. NOTE: Sometimes there are items that are forums that La Quadrature should not hesitate to pin the top of the list for the item to be included in the "Select" column. Use these in moderation. If after registration of your draft you'll be presented with an access denied but you still want to edit what you have to do, just add at the end of the url "/ edit". Voilà (there!) your press review is now online! It may take up to 10 minutes later for the drupal node to appear and be associated in the press review, with the icon "modifiy" and "download". If not, the URL for modifying directly is in the form of: http://www.laquadrature.net/fr/node/2145/edit and an edit tab is available within Drupal. This page was last modified on 30 May 2013, at 23:30.